Update: It’s a bit unclear whether this is a new vertical or simply an easier way to see men’s products that have actually been in Wanelo all along. The Wanelo blog has a series called Manelo Monday’s featuring menswear-focused users which indicates they’ve been around longer than we thought. 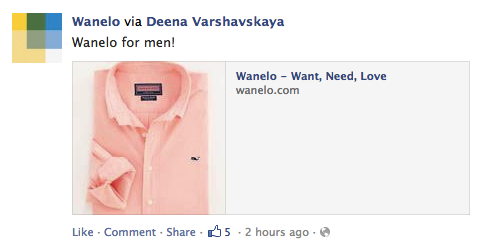 We have reached out to Wanelo for comment. CEO Deena Varshavskaya announced today that Wanelo has rolled out their popular “shopping entertainment” service, which was previously gear towards hip Pinterest-loving women, for men as well. The service curates the best shopping from popular sites like Pinterest, but ensures you can buy everything you find – a common frustration for otherwise satisfied Pinterest users. The Wanelo Shopping iPhone has quickly risen in the Lifestyle category, and currently holds the #7 spot in the category as well as the #93 spot for free apps overall according to AppData.com. The company also made headlines last week for raising their Series A at a $100M+ valuation. We have reached out to Wanelo for comment and will update when we hear back.